Have I mentioned lately how helpful the chats can be when it comes to finding things to write about? You guys don’t know how valuable you are. Dozens upon dozens of questions, if not hundreds upon hundreds, and out of those questions, longer posts can occasionally germinate. This is one of them! 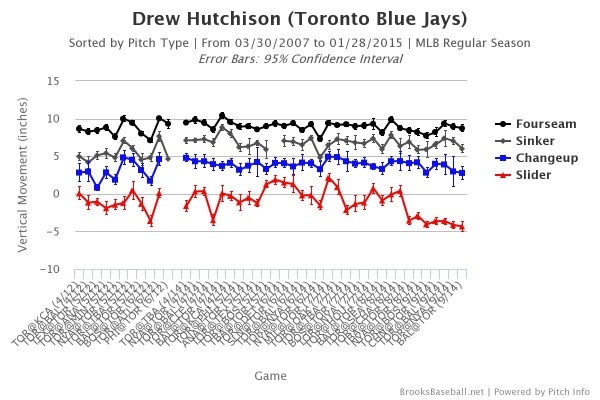 Because I’ve noticed a recurring kind of question about Drew Hutchison, and how much he might be capable of in 2015. Drew Hutchison had a 26% k rate and 7% walk rate in second half of 2014 after changing his slider (slower, more vertical movement), what do you think his chances of a major break out are in 2015? Dave Cameron: I think the research has shown that trying to use second half performance to predict future breakouts is a fool’s errand. Dave’s right, of course. The smart thing to do is to always bet against a breakout, as foretold by an encouraging second half. But that’s also boring, and one figures encouraging second halves can sometimes mean something for the season to come. We’re all just here to analyze, right? So, let’s do some analysis. 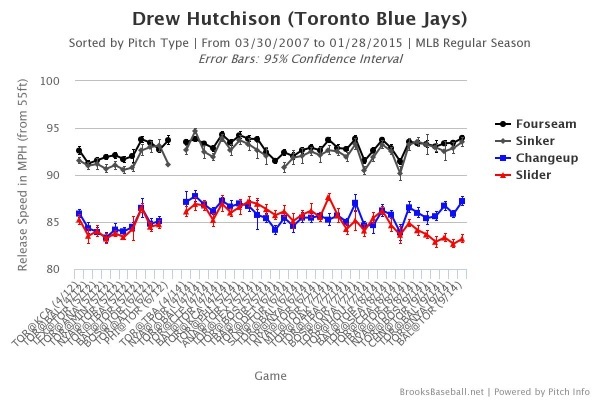 What on earth was the deal with Drew Hutchison’s slider? That’s abrupt. All of a sudden, Hutchison’s slider was a tick or two slower, and it was dropping another three or four inches. It had bounced around a little bit before, but never like this, and never with so much consistency. Something was different. Hutchison, it seems, made some kind of tweak. It’s easy to see the green blob move. But it’s not like things changed dramatically — there’s overlap between the two blobs, such that the sliders Hutchison was throwing down the stretch last year did have some precedent. Earlier in 2014, Hutchison did throw some sliders with a lot of vertical break. But toward the end, he threw them almost exclusively. Through August 17, 55% of Hutchison’s sliders had a vertical movement reading below 0, according to PITCHf/x. Afterward, 99%. That’s not the kind of thing that can be explained by coincidence. It’s clear, from those quotes, the Yankees were unprepared for the slider Hutchison was throwing. They’d seen him plenty before, and they’d seen him throw sliders plenty before, but on August 30, the slider was different and extremely effective. Hutchison was worse when he faced the Yankees again three weeks later. I don’t know how much to make of that. I think I accidentally skipped right by the very reason this is so interesting. The PITCHf/x plots show a significant change between Hutchison’s starts on August 17 and August 24. Why don’t we go ahead and split his season into bits? That’s a gigantic change in performance. And along with the different slider characteristics came different slider usage patterns. First, he threw the slider 21% of the time. Then, 31%. First, he threw the slider 33% of the time with two strikes. Then, 45%. The slider became the preferred putaway pitch against both righties and lefties, despite its reputation as a pitch with a broad platoon split. Pitch patterns don’t change randomly. Not like this, not over a handful of games in a row. Hutchison developed a lot more confidence in his slider. He knew what he was able to do with it, and he was having a lot more success keeping it consistently down and mostly out of the zone without being too far out of the zone. So Hutchison polished his slider and became more consistent with it over the course of seven starts or so. He immediately increased his level of trust in it, which allowed him to back off some from his changeup, which has never been a plus delivery to lefties. Between a low sharp slider and a high fastball, Hutchison mostly succeeded with two weapons. The changeup is still present to keep hitters honest. 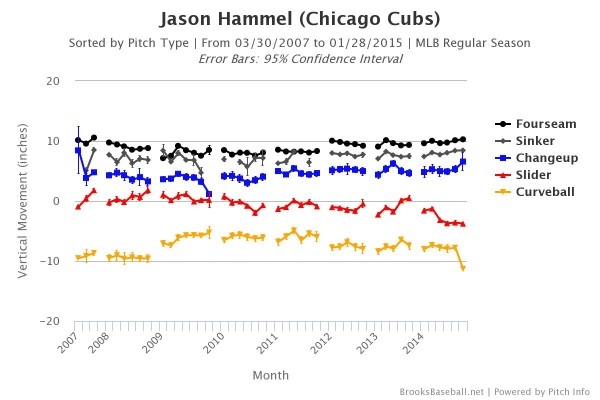 Hammel’s slider also experienced a midseason change in vertical break. It’s a decent comp for Hutchison’s, in terms of velocity and movement. Like Hutchison, Hammel threw his slider pretty often against left-handed hitters. And he was a lot better against lefties in 2014 than he was the year before. They say the slider isn’t a great pitch for righties to throw to lefties, but that’s a rule that has to have exceptions. The question is, what now? Hutchison was absurdly good after he started exclusively using his slower and bigger-breaking slider. That’s the encouraging bit. He did finish strong, and it does look like a quality breaking ball, visually. Hutchison’s increased confidence in the pitch can’t be written off. On the other hand, there are two things. For one, who’s to say Hutchison’s slider will be so consistent again in 2015? And for two, now teams will have had more of a chance to prepare. The Yankees were caught off guard in August by Hutchison’s breaking ball. They were more successful the next time they met. Players in the league are always adjusting, and adjustments back don’t always happen immediately. There can be a delay, and perhaps, in Hutchison’s case, the word is out that his slider has a lot more consistent depth. As long as Tyson Ross exists, there’s reason to believe righties can be effective against lefties leaning heavily on a slider. Hutchison demonstrated his own ability through seven late-season starts. It’s absolutely right to be encouraged. And it’s absolutely right to be curious. Hutchison’s slider might just be a part of him now. And in 2015, opposing teams get to take that into consideration. Somewhere in August, Drew Hutchison figured out his breaking ball. Now it’s on the league to try to figure out Drew Hutchison. We hoped you liked reading How Good of a Weapon Did Drew Hutchison Find? by Jeff Sullivan! I hope your hands don’t fall off from all the writing you’ve been doing over that past couple of days, Jeff. Great stuff, as always!